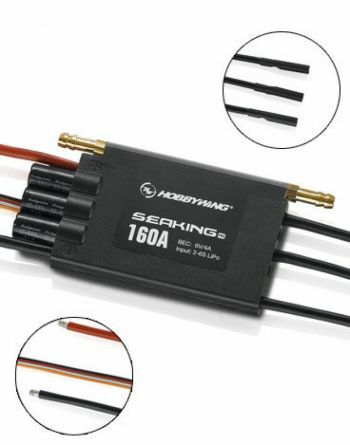 SEAKING 160 ESC with Turbo Function. 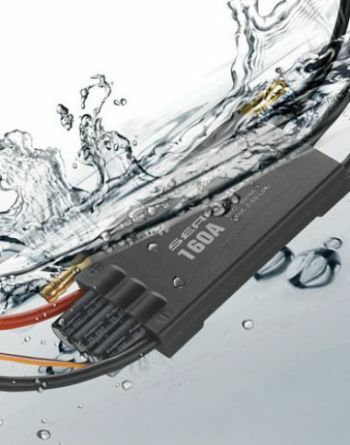 Specially designed for boats, with excellent water cooling, built-in BEC and waterproof design. Turbo function to increase timing on the fly. This works with 3 or 4 channel radio systems. The 3rd or 4th channel is used as a switch to increase the timing to a value you have programmed into the esc using the optional multi function program box. Output: Continuous current 160A, burst current 1050A (0.1S). Notes: This will not work with the standard Seaking program box. Requires pn# ker-100pro Multifunction LCD Professional Program Box. This esc is suggested for smaller boats upto the 27"- 40" (550mm - 1000mm) range. Because there are so many variables with each hull and installation its impossible to specify all the applications for this esc. If you have any questions on using this esc with your particular boat, please contact us before purchase.